Holland America Line's extraordinary South Pacific cruises offer the exotic without having to fly! Holland America offers a wide variety of Fiji cruises and extended cruise journeys that cross the Pacific Ocean to Hawaii and Tahiti. Holland America South Pacific cruise itineraries offer unique ports of call and award-winning shore excursions. Even those who have previously cruised or visited the South Pacific will experience something new with Holland America Line. Let your Pacific island dreams come true in the exotic landscapes of French Polynesia, New Caledonia, Vanuatu, Fiji, Samoa and Hawaii. Discover a world of ancient mysteries in the Maori Haka and aboriginal didgeridoo. Some of the grandest mountains in the world stand hip-deep in the blue Pacific, garlanded with jungles. In Hawaii, see the Earth bleed fire at the Kilauea volcano, play a round on a world-class golf course, or pay your respects at the USS Arizona Memorial. Cruise to Tahiti, where Bora Bora's sapphire lagoons reorders all priorities. Walk through Papeete's variegated public markets or take a jungle river cruise on the island of Raiatea. Relax at sea aboard our spacious and elegant mid-size ships and immerse yourself in our Greenhouse Spa, Culinary Arts Center and Explorations Cafe. Learn about Polynesian history and culture from our Exploration Speaker Series and create a digital "show and tell" of your vacation memories through our Digital Workshop powered by Windows. With a premium Holland America Line Hawaii cruise, paradise will stay with you long after your voyage. Choose Holland America's Hawaii & Tahiti cruise which begins and ends in San Diego, California. Give yourself an extended escape for 30+ days to Hawaii, Tahiti and the Marquesas Islands. You'll enjoy even more luxurious sea days and discover the remote South Pacific islands of Paul Gauguin and James Cook. As part of our ongoing Signature of Excellence program, we continue to add enhancements and new features to our fleet of ships, including dramatic new public areas and stateroom upgrades, as well as expanding our enrichment program. Under the latest series of enhancements, we are introducing new soft goods, new carpeting, completely renovated bathrooms, new Spa staterooms and. Spa staterooms located near the Greenhouse Spa offer exclusive amenities such as an organic cotton bathrobe and slippers, yoga mat, water fountain, special room service menus and treatments, and more. Additionally, on all ships, staterooms feature the Mariner Dream Bed with premium plush Euro-top mattress and high-quality cotton bed linens, flat-screen TVs and bathroom enhancements ranging from deluxe bathrobes to lighted, magnifying make-up mirrors. All suites include comfortable bed duvets, fully-stocked mini-bars, DVD players with access to an extensive DVD library, personalized stationery and use of the exclusive concierge-staffed Neptune Lounge. Mix, a new bar concept with three specialty lounges serving their namesakes: Martinis, Champagne and Spirits & Ales. Showroom at Sea, a glamorous nightclub with performances featuring Broadway entertainers. A new resort pool feature called The Retreat, complete with an upscale pizzeria and a giant LED screen for evening movies. Canaletto, an Italian restaurant comes to life for dinner with gourmet Italian selections. The exceptional onboard cruise experience delivered by Holland America Line and the Signature of Excellence enhancements appeal to discerning cruisers who prefer mid-sized ships, personalized service, five-star dining, and sophisticated ambiance throughout both public areas and staterooms. To date, Holland America Line has invested more than $566 million into Signature of Excellence. Always at the heart of the Holland America cruise experience is a warm and award-winning style of service that is never in the way and never out of reach. Expect excellence: we sail with nearly one crew member for every two guests, for the impeccable service that has long defined classic cruising. On board the cruise ships of Holland America Line you'll discover a luxurious experience that is modern, fresh and appealing - in an ambiance that is timeless and refined. From the moment you arrive onboard, you are welcomed as an honored friend. Gracious service sets the tone. Polished presentation, warm and personal attention - Holland America Line crew takes pride in making your cruise relaxing and remarkable in every way. Prompt and gracious, never in the way yet never out of touch. Relax and enjoy the signature style of service for which we are known. 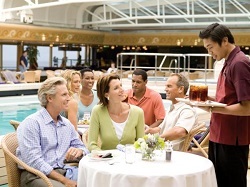 Holland America's professional crew has been academy trained in the art of remembering guest preferences. Because Holland America sails with a high crew-to-guest ratio, you'll experience service that is truly prompt and attentive. Your stateroom is attended to twice a day; a morning service to clean and refresh linens and towels, as well as an evening turndown service. Complimentary shoe shine service is our pleasure, along with ice delivered to your room. Dining stewards work in teams of two to ensure your experience is perfect, across all five courses. Expect croupiers in the Casino, European-trained spa aestheticians, and professional bar staff. Pinnacle and Neptune suite guests enjoy the services of a personal concierge to organize spa, dining and shore arrangements. Come revel in spacious rooms, breathe in expansive views and relax in easy elegance. Rich woods, beautiful floral arrangements and handsome furnishings create an inviting atmosphere in which to gather. Beautifully appointed lounges, reception areas and halls feature museum-quality paintings, sculptures and antiques - a collection that is highlighted in our self-guided iPod walking tour available onboard. Outdoor areas offer comfortable chaise lounges, breezy cabanas and sunny seating around the pool. 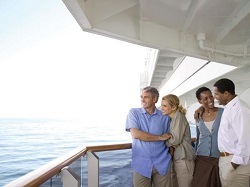 Holland America's mid-size ships are purposely designed to accommodate fewer guests than many premium cruise lines. As a result, you'll experience smoother embarkation, disembarkation and tendering processes, as well as easy access to reception, dining and shore excursion services. Unpack once and let the vacation begin. Each spacious stateroom is a haven of serenity and space. We invite you to relax in this perfect blend of modern enhancements and timeless comfort. Enjoy refined amenities and our Holland America's signature Mariner's Dream bed, which graces each elegant stateroom and suite. A plush Euro-Top mattress and finely woven cotton linens ensure deep and restful sleep onboard. Retire each evening with a dark chocolate pillow gift and good wishes from the Captain and crew. 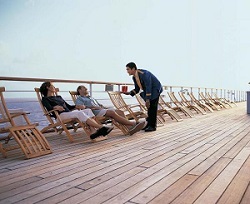 Most staterooms are ocean-facing; many have teak-lined verandahs for dining alfresco or sunbathing in private. Luxurious bathrobes hang in the wardrobe. Elemis Aromapure skincare and spa-therapy products await in your bathroom, along with large, 100% Egyptian cotton towels. Turn on your flat-panel television to the latest in headlines, sports or your favorite show. Savor diverse restaurants and menus. Choose a set seating time each evening or be spontaneous. As You Wish dining is all about flexibility and freedom. One level of our main Dining Room hosts sittings at 5:45pm and 8:00pm; the other is reserved to welcome guests as they arrive. And throughout the ship, there are restaurants to suit every mood, from Italian cuisine one night to a perfectly grilled porterhouse steak the next. Enjoy an elegant breakfast, leisurely lunch or unforgettable five-course dinner, the main Dining Room is your destination for sophisticated dining aboard. On Holland America's menus you'll find classic favorites and vegetarian choices as well as regionally inspired cuisine prepared by chefs who have been inducted into the prestigious Confrerie de la Chaine des Rotisseurs, an international food and wine society. Pinnacle Grill Specialty Restaurant - Refined and luxurious, the Pinnacle Grill represents the pinnacle of exceptional dining on board. Make reservations and plan to celebrate the day's adventures in this intimate setting graced by luxurious appointments such as Bvlgari china, Riedel stem ware and Frette linens. Open for lunch and dinner, the Pinnacle Grill features dishes inspired by America's Pacific Northwest, including delicious seafood and choice, sustainably raised beef from Washington State's Double R Ranch. Guests can look forward to broiled Alaska king salmon and perfectly grilled steaks, beautifully complemented by boutique wines from the Pacific Northwest and other great global vintages. Canaletto Specialty Restaurant - Spartire is the Italian word for sharing. Canaletto's innovative menu is designed around this authentic Italian experience, offering a variety of dishes to enjoy with family and friends. Share a taste of delicious zuppa di pesce, a tomato saffron broth studded with mussels, scallops and vegetables. Or savor classic Italian pasta in all shapes and sauces. Main dishes include veal, roasted pork loin and grilled fish. And dessert - chocolate tortas, gelato and a trio of tiramisu. Lido Restaurant - At the top of the ship, the Lido Restaurant offers relaxed dining and panoramic views of the sea. Rise and shine to a variety of tantalizing breakfast selections including pancakes, fresh fruit, eggs and omelets cooked to your liking and more. Lunch offers bountiful choices from around the world - Asian cuisine, pizza, made-to-order bistro selections, gourmet sandwiches and soup, and an extensive salad bar. In the evening, enjoy entrees from both the Lido and the main Dining Room, along with gracious table side service and wine selections from the cellar. Casual attire is always acceptable in the evenings at the Lido. This ground breaking concept blends guests love for food and entertaining into a unique, interactive experience. Explore regional fresh ideas in food and entertaining while you sail. Discover your inner sous chef or how to choose the perfect wine. Holland America is teaming up with America's Test Kitchen to offer an enticing selection of live onboard cooking shows and hands-on workshops. Guests will learn foolproof techniques and user-friendly recipes for making delectable dishes with confidence. Learn new culinary skills and advanced techniques to create perfect pies or handmade pasta, decorate cakes or whip up delicious egg dishes; during the 90 minute hands-on workshops! Enhance your culinary knowledge with 45 minute cooking shows; enjoy cooking demonstration, engaging videos, and recipes on everything from chocolate desserts to Asian dumplings! You will easily fall into the rhythm of relaxing and inspiring days onboard! With a wealth of cruise activities and enrichment programs for your pleasure. One day you might opt for a hot stone massage in our luxurious Greenhouse Spa and Salon, another day elect to attend a cooking demonstration in the world class Culinary Arts Center, improve your golf swing or spend time at one of the pools. Discovery, both of new countries and new places within ourselves, is the true spirit of world travel. You'll find worlds of education, activity, enrichment and inspiration onboard Holland America Line cruise ships. Public rooms, with rich, polished woods and soft leather furniture create an inviting ambiance in which to gather. Staterooms filled with all manner of sophisticated amenities beckon you to retreat for hours. There is a certain kind of elegance that never goes out of style, inviting you to relax into a world of comfort and easy elegance aboard the spacious cruise ships of Holland America Line. Breathe deep the tropical perfume of the Pacific islands: Hawaii, Samoa and Fiji. Savor exquisitely fresh mango, papaya and pineapple from local island markets. Gaze at the majestic natural beauty of New Zealand's fjords and southern alps. Experience a world of ancient aboriginal traditions in the haunting sounds of the didgeridoo. Revel in the cosmopolitan attractions of Sydney, Melbourne and Auckland on our Australia cruises. Be among the few to explore Tasmania on a New Zealand cruise. Holland America Line's Australia, New Zealand and South Pacific cruise vacations will enchant your senses. 20 Day Tahiti & Hawaiian Islands Cruise From $1999 US! 51 Day Ultimate South Pacific Cruise Roundtrip San Diego!